Gold fell back again on Thursday to hover just above 20-month lows as the US dollar rebounds and equity investors celebrate the longest bull run in Wall Street history. December futures trading in New York declined 1% to $1,190.50 a troy ounce, ending a four day winning streak. The price of the metal is down more than 7% year to date. 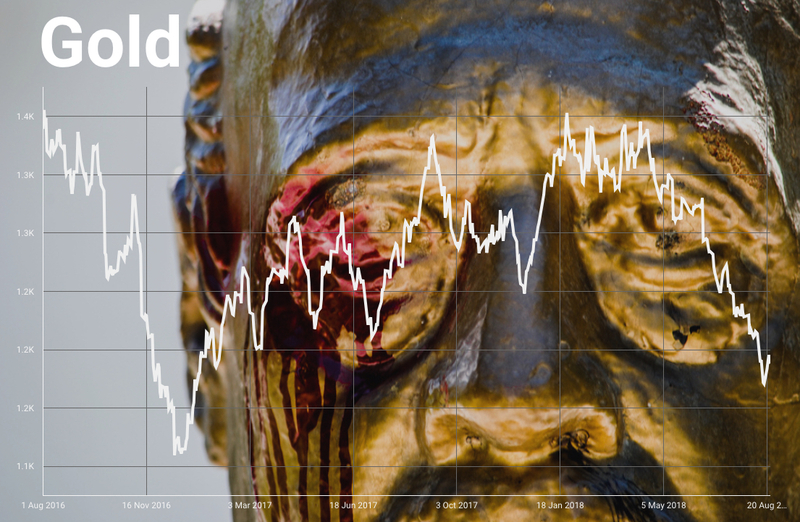 Rate hikes, low inflation, the strong dollar and buoyant stocks have sapped investor appetite for gold. According to the CFTC's weekly Commitment of Traders data up to August 14, investors (non-commercial traders) are now short 215,467 lots, the equivalent of 670 metric tonnes. In a research note ANZ, a bank, points out that the short position (bets that gold will be cheaper in future) is the highest since data was first collected by the CFTC in 1993. 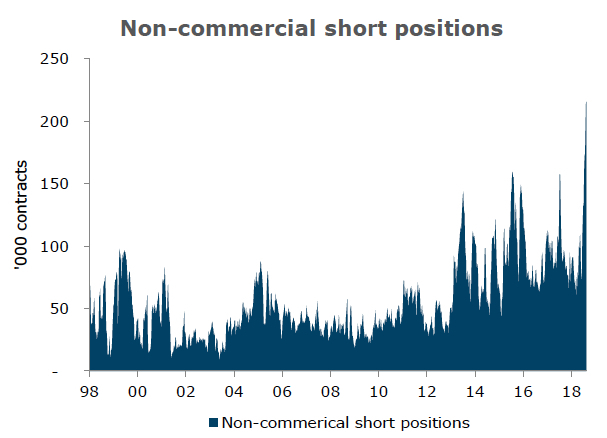 It's also the first time since 2001 that investors have entered a net short position (gross shorts exceeding gross longs). 1999, short positions rose fivefold to hit a then record level of 80,000 contracts. Not long after, gold prices rallied 16% from USD250/oz to USD290/oz over the course of two months. Short positions spiked again in July 2005 and January 2016, with gold prices rallying 12% and 14% respectively over the subsequent three months. In both these cases, the net long position was extremely close to being negative. This raises the spectre of investors closing out their record level of short positions, and thus starting a short covering rally. The CFTC started breaking out the data by type of investor in 2006 and the net position of so-called money managers – mostly hedge funds and other large scale speculators – is also at a bearish record of more than 200 tonnes. The World Gold Council in a report released Wednesday provides more ammunition for gold bulls. The industry body says while net shorts were more prevalent in previous decades, there have been structural changes including expansion of central bank reserves, miner de-hedging and the lower opportunity cost of holding gold that "make these positioning levels different and likely short lived". 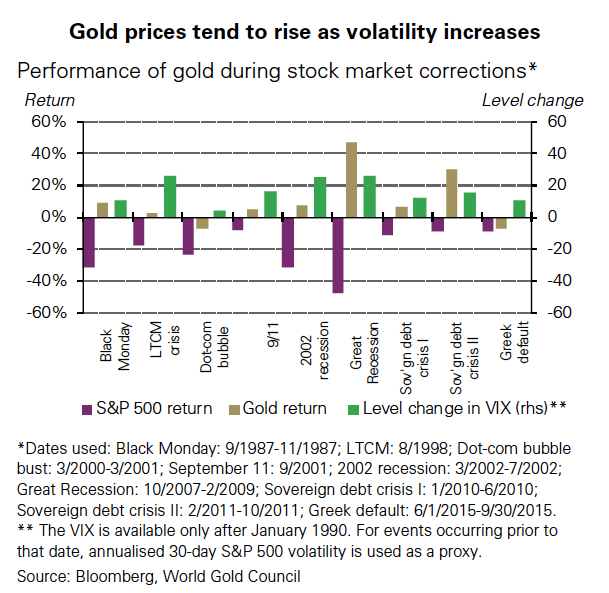 Another factor in gold's favour is apparent investor complacency on stock markets and volatility in the gold price at a 17-year low despite a long list of geopolitical worries, threats of an emerging market meltdown and an intensifying global trade war. Gold's status as a safe harbour in times of trouble has been severely dented in recent years. It may yet reclaim that reputation.